Onsite energy generation is gaining a foothold across the globe as costs continue to decline and efforts are underway to make the most of existing resources while also reducing carbon emissions. Whether you’re a manufacturer seeking to reduce skyrocketing utility bills or you’re a hospital hoping to remain fully functional in the event of a natural disaster, a combined heat and power (CHP) solution can cost-effectively help you meet your energy, resiliency and sustainability goals. CHP, also known as cogeneration, captures waste heat produced during power generation and uses that energy for thermal applications such as heating or cooling. CHP enables heat that is normally wasted during conventional power generation to be recovered as useful energy, which avoids the losses that would otherwise be incurred from the separate generation of heat at a different facility. 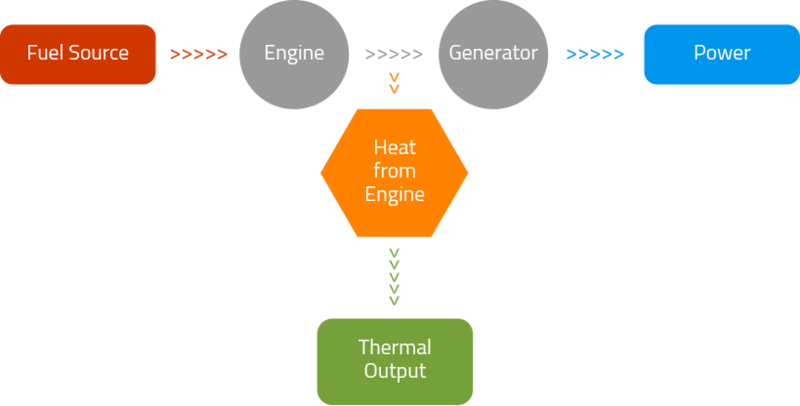 While the conventional method of producing usable heat and power separately has a typical combined efficiency of 45 percent, CHP systems can operate at fuel efficiency levels as high as 80 percent. CHP is on-site electricity generation that captures the heat that would otherwise be wasted to provide useful thermal energy. The thermal energy recovered is then used for heating, cooling or other required industrial processes. In some cases, clients can also sell excess electricity to the transmission system via independent system operator (ISO) or regional transmission organization (RTO) programs. In conjunction with its in-depth CHP experience, Encorp combines an innovative mix of hardware and software solutions to enable assembly and control of your CHP solution. Our Egility control platform delivers the control architecture required to maximize the use of CHP and the intelligence needed to be sure power is provided to critical loads in the most economical method possible. Our control system works in tandem with our monitoring software and digital-paralleling switchgear to remotely dispatch, aggregate and control your CHP energy generation and interconnect it with your utility resources. We have experience working in both commercial and industrial facilities, and have integrated our technology with engines provided by the world’s leading manufacturers, including CAT, Waukesha, Cummins, Deutz, Wärtsilä and more. A confluence of economic factors, including low natural gas prices, government and utility incentives, and low interest rates, are causing an upsurge in the use of CHP solutions. According to the Combined Heat and Power Association, approximately 50,000 MW of CHP capacity was developed in the U.S. over the last 35 years, and due to a recent executive order, another 40,000 MW of new CHP capacity is targeted for deployment by 2020. New providers attempt to enter and capitalize on this growing market every day, but as one of the oldest and most established players in the industry, Encorp is the partner trusted by industry leaders including Siemens Building Technologies, the City of Chicago, the U.S. Army, El Paso Natural Gas, and more. CHP’s highly-efficient approach to generation of both electricity and heat has always made sense for the industrial sector. New advances for managing on-site energy generation, have now made CHP more attractive for smaller applications such as commercial office building and hospitals too. Whether you are one of the world’s leading financial services companies, like Broadridge Financial Solutions, or a smaller scale operation, like Monroe Community College in New York, we can help. We have provided CHP control systems to over 100 companies. We are ready to help you too. Learn more about our most successful projects now.